I was in a mood for good Asian food. Usually, I like to go out and have delicious miso soup and vegetable fried rice. This is because I have tried to make fried rice so many times and so many different ways and yet I never seem to make something that I really enjoy and would want to make again. I decided to give fried rice one more try in the kitchen, this time playing with a different sauce. It came out incredible. I would make this rice over and over again. I think a combination of things I did really made this so delicious. So here’s the secret recipe…. 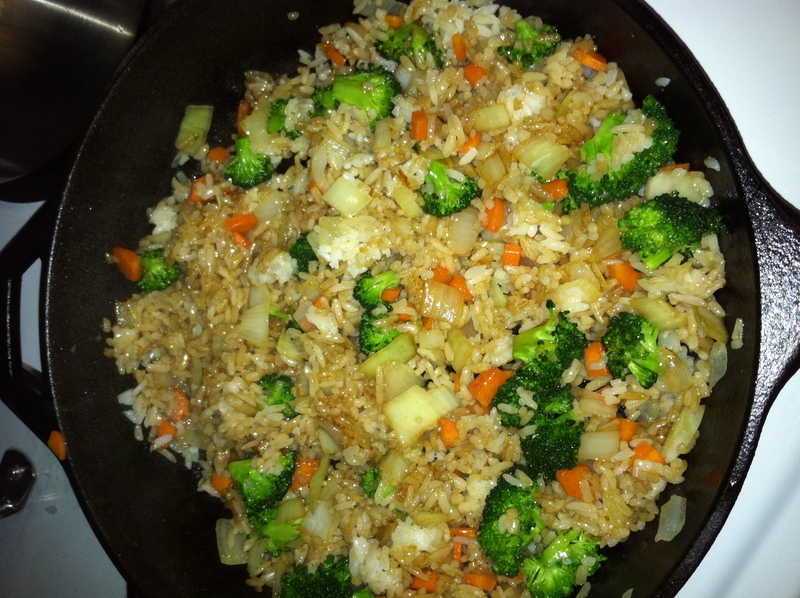 Note: Assuming one serving is 1/2 cup of fried rice, this recipe will yield 6.5 servings. This worked out to be a good amount for me because I kept it in the fridge to have later for dinner and for meals for the next day as well. Start by washing and cutting your broccoli and carrot into bite size pieces. Then steam them in a pot for about 5 minutes so that they become a little bit more tender. Set that aside and cut your onion into bite size pieces as well. Then place one tablespoon of olive oil in a sauce pan over medium high heat. 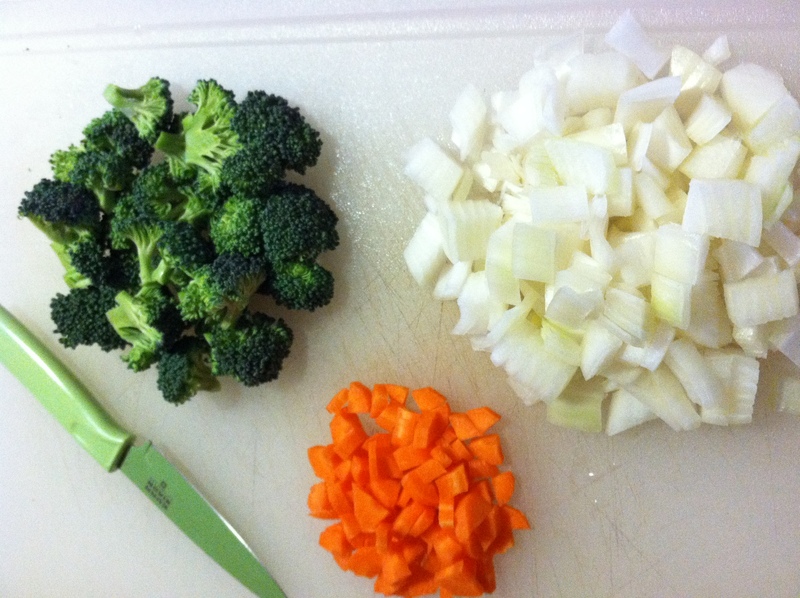 When this is hot, add in your washed and cut vegetables: carrot, onion and broccoli. Cook for about five minutes. Then add your cold rice to the pan as well. 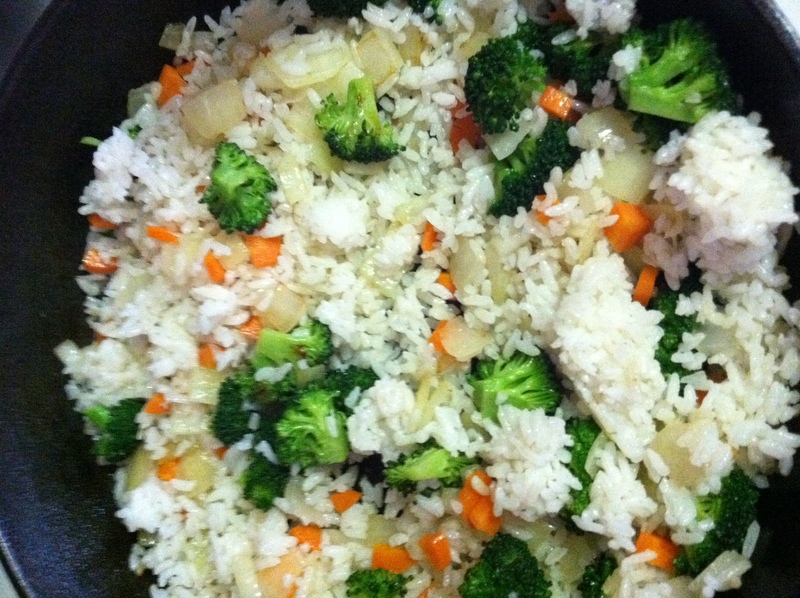 Stir the vegetables into the rice, while it heats up. When your rice is warm, add in the sauce. Stir well and serve. This goes well with barley miso soup if you have a couple extra minutes to make some! 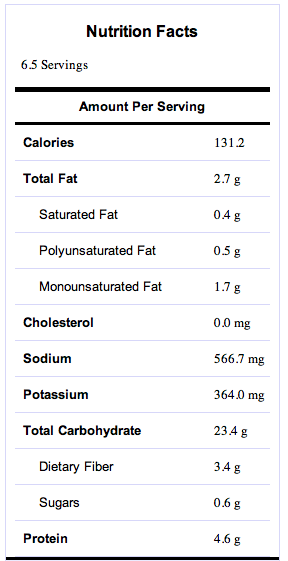 So let’s talk about the nutrition facts for this fried rice. One serving has 131 calories, but that’s probably not what you were worried about. You are considered about the sodium. Most fried rice has a lot of salt, which makes it obviously less healthy. One serving of this fried rice contains 566 milligrams of sodium. This sounds like a lot but compare it to your daily recommended amount. According to the 2010 Dietary Guidelines for Americans, it is recommended to have less than 2,300 milligrams of sodium a day. If you have one serving of this rice, that is a quarter of your daily intake of salt. I would say this a dish you can enjoy and not worry about overdoing your sodium, just make sure your other meals throughout the day are not high in sodium. Moving on, this fried rice, as you might imagine, contains a lot of vitamins and minerals that are good for you. The full facts are included in the above pictures but I also wanted to mention a couple in particular. In one serving, you get over 50% of your daily vitamin A, almost 150% of your daily vitamin C, 25% of your daily folate and about 22% of your daily manganese. I’ve found that fried rice gets the perfect texture when you use day old, cold rice, have you tried that? It’ll stop the rice from clumping. That’s what I used this time. I had day old rice that I didn’t know what to do with so I decided to turn it into fried rice. You are right, it really does help to stop the rice from clumping. This is also my first time making fried rice with white rice. Usually, I’ve used brown rice which gives a different texture. I like the texture of the white rice better even though its less healthy than using brown rice.